Dengue Fever Strikes Millions. Now Scientists Hope To Strike Back : Goats and Soda It's called "breakbone fever" because that's how bad you feel when you get it. There's no cure. But scientists have found powerful antibodies that could lead to the development of a simple vaccine. 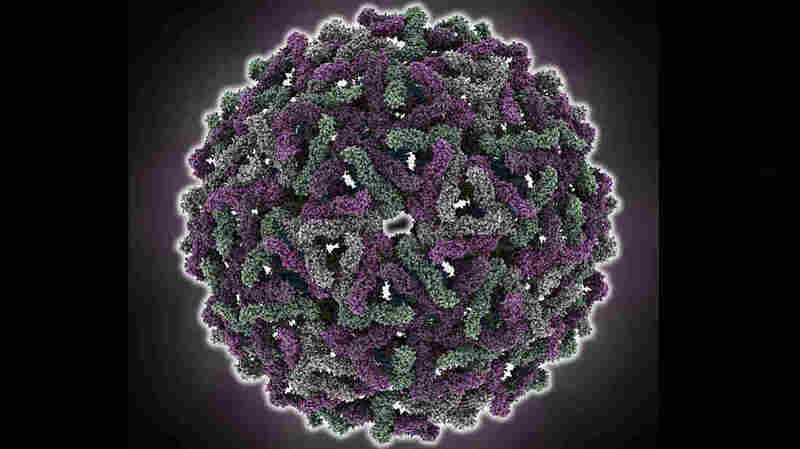 The dengue virus has an icosahedral shape, similar to the pattern on a soccer ball. Antibodies stop the virus by binding to its surface. Dengue — aka "breakbone fever" — has been a tough nut to crack when it comes to making a vaccine. The problem is that the mosquito-borne virus comes in four flavors, or strains. Vaccines that work on one strain haven't worked well on the others. Now scientists at Imperial College London have discovered a potential way around this problem. Immunologist Gavin Screaton and his colleagues have found molecules — specifically antibodies — in human blood that stop all forms of dengue. The molecules offer a road map for developing a simple vaccine that works on all types of dengue at the same time, the team reported Monday in the journal Nature Immunology. Scientists really didn't think that was possible before this study, Screaton told reporters last week. Dengue sickens millions of people globally, the World Health Organization says. The virus threatens to spread to Europe and the U.S. Both Florida and Texas have experienced outbreaks. Since there's no cure for dengue, a vaccine is critical to stop the growing threat, Screaton says. "Really there's a great deal of hope placed on vaccines [for dengue]," Screaton said. "I think that without a vaccine, this disease is not going to be controlled." The strategy, so far, has been to engineer a separate vaccine for each strain of dengue — which means four times the effort and four times the roadblocks. The results haven't been great. Take, for instance, Sanofi Pasteur's vaccine. The pharmaceutical company spent 20 years — and a billion dollars — to develop an experimental vaccine that includes separate proteins from all four types of dengue. After three shots, the experimental vaccine reduced the risk of getting two types of dengue by about 70 to 80 percent in a large clinical trial in Latin America. That's not too bad. But for the other two types of dengue, the protection was only cut in half, to about 40 to 50 percent. The vaccine did reduce the number of severe dengue cases by about 80 percent. In most cases, dengue causes severe flu-like symptoms, with a high fever, a bad headache and extreme pain in joints and bones, hence the nickname "breakbone fever." But in a small percentage of cases, people get a more severe form of the disease. They have leaky blood vessels, severe bleeding and organ failure. This form of dengue is fatal about 20 percent of the time if left untreated. People are more likely to get a severe case of dengue the second time they catch the virus, Screaton said. Recovering from one type of dengue doesn't give you protection from the other types. Instead, it might make the second infection worse. "Something about the immune response to the first contact [with dengue] primes you for a worst outcome," Screaton said. That's another reason why having a vaccine that works on all forms of dengue is important, he said. To find a way to stop all dengue viruses at once, Screaton and his team got blood samples from seven people infected with the virus. Then they scoured the blood for powerful dengue antibodies that take down all four strains. The goal now is to build a vaccine that triggers these antibodies. To do that, Screaton and his team figured out how the antibodies work: They stick to a weak spot on the virus' surface. Now the researchers can use that weak spot — which is simply two viral proteins — to make a vaccine. It will, of course, take years to develop and even more time to test it in animals and people.